Proven with Parrots, Birds of Prey, Waterfowl, Gamebirds, and park birds, plus rare species. Improved proportional solid state thermostat with accuracy of +/-0.5°C, with fine and coarse control facility. Three turning trays as standard. The central one may be substituted with a set of rollers. Or all three replaced. The new high precision humidity control, gives required humidity at the turn of a dial. Pumps water from an external supply to limit bacterial infection. Tough, thermally efficient cabinet, with hard epoxy coat to give an easy surface to sterilize. Research has shown that eggs from certain species require a different method of turning as compared to the majority. These eggs need assistance with their embryo development. By placing the eggs on their sides and turning them through 180° on rollers for the first 10-15 days of the incubation period, a good membrane development can be obtained. 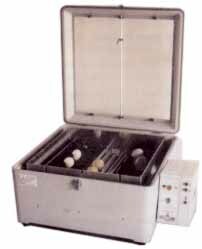 Once the embryo is secured to the pointed end of the egg, it can then be placed into a plastic insert in the same machine. 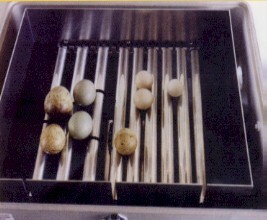 The eggs can then be turned in the traditional vertical position through 90°, until the eggs are ready to hatch having observed the internal pipping. Various sizes of Rollers are available, please refer to the price list. Guarantee. All our products are fully warranted for 12 months from date of purchase. Should any fault arise, please consult your local distributor or A.B. Incubators. Consequential damage Is specifically excluded. We are continually striving to Improve our products, and in so doing we reserve the right to alter materials or specifications without notice. Our Standard Conditions of Sale are available on request.